The Spins' first self-titled EP came out January 2006, and features five party-rock songs from The Spins' college rock days. 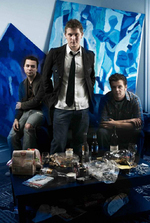 While "Say You're Sorry" and "Tell Her Something" show off The Spins' R&B influences, tracks "December" and "Late Late Show" present the grandiose pop-rock band that The Spins would become. The music video for "Tell Her Something" won Best Music Video in San Francisco at the 2006 Alice 97.3 3-Minute Film Festival. You can check it out at myspace.com/thespinsband. Jaime was the girl back in high school who always sat alone by the door. When I said, ?I?m Dave, hey, won?t you give me your name?? She said, ?What do you want that for?? And despite all the pleas of a girl?s enemies, she never cared if they sighed. The girl nobody knew , but everyday had to dream of a better life. Jaime, it?s over, I know it?s always on your mind. Jaime, it?s over, you got a new life starting tonight. Jaime went and married a rich man while I stood alone by the door. When she said, ?Don?t move, I?m gonna see you soon,? I said, ?What do you want that for?? And now she?s sitting alone with her hands to the phone at the Detroit City Bar. And we laugh at the days, and how much we?ve changed, without ever getting very far. Now every time I look in the mirror, I can?t believe my eyes. I think of how I was only seven years old, my brothers were my whole life...and the people I love, and the people I don?t, and the ones I?ve left behind...I don?t care what you say, it?s a miracle, baby, that we?re all here tonight. I don?t mind if you say I can spend the night with you on the sofa. It?s cold and dark outside, but the clock reads 45. I?ve lost my sight and my composure. I was driving alone, you coming fast and slow, and your hair in the snow was all I remember. Two flames collide, and the fireplace comes alive. It?s the same as you and I, on in December.